Can we debate the King Coal Highway honestly? May 10, 2013 by Ken Ward Jr.
We’ve got to have an economy for West Virginia for life after coal. Coal is quickly depleting and if we don’t do that, than what have we left our children and grandchildren. It’s good to hear from folks at the Mingo County Redevelopment Authority, one of the few local groups that has really tried — especially under the leadership of the late Mike Whitt — to focus on these issues, and to find ways to bring new jobs and a brighter future to our West Virginia coalfields. And the Buffalo Mountain Surface Mine permit that CONSOL Energy proposes as part of the highway project is certainly a timely topic, as the comment period on the latest environmental study is coming to a close. Kominar said Consol has been fighting for the permit since 2007 and believes the EPA is doing everything it can to stop or stall the permit’s approval. Both the Army Corps of Engineers and the Federal Highways Administration have signed off on the environmental impact study that details how Consol will maintain run off and address water quality issues, but Kominar said that hasn’t been enough. “… They say it’s an environmental concern, but their argument holds no credence. There’s no scientific evidence to back up what the EPA is saying except emotional testimony by people to say, well, it’s going to cause this or it’s going to cause that,” he replied. “We live here, we breathe this air, we drink this water. We obviously don’t want to destroy ourselves. There’s no evidence to prove that what some of the antis are saying is actually valid,” Kominar said. Let’s be clear on what public broadcasting reported — without presenting anyone questioning it — There’s no evidence to prove that the kind of mining CONSOL is proposing here damages the environment? No evidence? It’s hard to know where to start here. But there certainly is a lot of evidence in the peer-reviewed literature that shows large-scale surface mining is linked to pervasive and irreversible impacts on water quality. Southern Appalachian forests are recognized as a biodiversity hot spot of global significance, particularly for endemic aquatic salamanders and mussels. The dominant driver of land-cover and land-use change in this region is surface mining, with an ever-increasing proportion occurring as mountaintop mining with valley fill operations (MTVF). In MTVF, seams of coal are exposed using explosives, and the resulting noncoal overburden is pushed into adjacent valleys to facilitate coal extraction. To date, MTVF throughout the Appalachians have converted 1.1 million hectares of forest to surfacemines and buried more than 2,000 km of stream channel beneath mining overburden. The impacts of these lost forests and buried streams are propagated throughout the river networks of the region as the resulting sediment and chemical pollutants are transmitted downstream. There is, to date, no evidence to suggest that the extensive chemical and hydrologic alterations of streams by MTVF can be offset or reversed by currently required reclamation and mitigation practices. 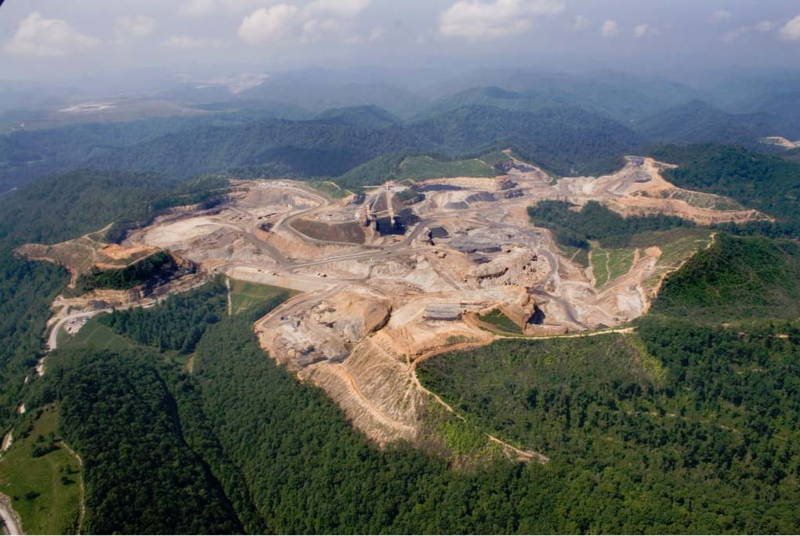 Other studies continue to raise questions about mountaintop removal’s impact on public health in the coalfields, and another very recent paper outlines a long list of other concerns about mountaintop removal that often don’t get as much attention as they should. Even the industry-funded scientists from the ARIES project weren’t trying to argue that there’s no evidence that this type of mining is damaging the environment (see here and here). I guess it’s a testament to the quality of the political and policy discourse in West Virginia that statements like the ones reported in this public radio piece get out there without being questioned. But if West Virginia is to make wise choices about its future, especially as it related to coal, the good and the bad sides have to be part of the discussion. The project would also leave hundreds of acres of flat land for development near the highway that Kominar said is crucial to growing the economy of a single-industry area. “It has to be complete to have the full effect, again to connect Detroit to Myrtle Beach, but then, basically transition the southern tip, the southern coalfields all the way into Mercer County and to Route 77, then that whole area can grow and diversify, but it really depends on that road,” Kominar said. But the proponents lose credibility when they say things like there’s no evidence that this kind of mining damages the environment. And the proponents of this project have already eroded the quality of the debate on this, as political leaders such as Sen. Joe Manchin have tossed around unsupported figures about the potential jobs that would be created. Regular readers of this blog know that post-mining development on sites that mountaintop removal has left flattened are fairly rare (see here, here, here and here) and that through the years part of the reason for that is WVDEP’s fairly lax enforcement of the post-mining land use requirements. If this particular project is a good one, then the proponents will be able to make their case for it without misleading the public about the science and the economics involved. I heard this story on WV Public Radio this morning too; and had the same reaction. Let’s hope they will do a follow-up story and present some opinions from the other side. Thanks for your comment … but what the story needs aren’t “opinions from the other side,” but some science … Ken. Science ken? Lol! Hendrix can’t testify to a reasonable degree of certainty that mtr causes health problems can he? And guess what, 18 years ago I built a house. . Moved earth, the impact of my foundation are pervasive and irreversible. The house building example represents a fundamental misunderstanding of the scientific process. This process is simplified as… 1. observe 2. question 3. test 4. present results and REPEAT. If a (statistically) significant amount of evidence accumulates, a scientific theory comes about (like Einstein’s theory of relativity). Or, if there are no known exceptions, a scientific law is established (like gravity). This process is not equal to, nor should it be presented as equal to, the opinions or beliefs of outspoken individuals. Hendrix is not an isolated individual spouting random opinions in an effort to bring down the coal industry. His work is just one integral part of a larger ongoing scientific process. Emotional, anti-rational, opinion-based arguments are flies in the ointment of human progress. True enough, Ken. But it has to be those with a different opinion that present that science in a news story. The coal supporters are certainly not going to present it. The WV Public Radio story should have included interviews with environmental groups or independent researchers who could present that science properly.